With Thanksgiving just around the corner, you might be looking into restaurants that cater in Arlington. If so, what better way to celebrate the holiday of thankfulness than with Texas Jack’s? Trust us when we say that you’ll be thankful for the feast that we’ll prepare for you. Whether you’d rather dine in with us (you’ll need to make a reservation, but more on that below) or you would prefer to place an order for pickup, we’d love nothing more than to help make your holiday a smashing success. If enjoying food from our barbecue restaurant on Thanksgiving sounds up your alley, keep reading to learn more! In-house hours for Thanksgiving will be from 11 a.m. to 7 p.m. and we’ll be taking our last reservations for 6 pm. 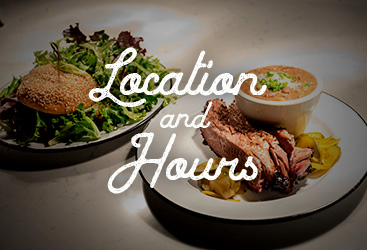 That means that you have plenty of time during the day to enjoy your feast at Texas Jack’s. Whether you’ll be out and about taking advantage of Black Friday deals (that for some reason start on Thursday despite the fact that Friday is right there in the name of the sale) or you just don’t want to cook at home, we make it easy for you. Click here to make reservations for Thanksgiving. So what’s actually on our Thanksgiving menu, you ask? Great question. How does beef brisket, turkey, pulled pork shoulder, duroc pork belly, spare ribs, and beef sausage sound to you? Sounds pretty good to us too! We’ll also be serving favorite sweets like mini pecan pie and mini pumpkin pie alongside of all of your favorite starters and sides (along with some festive additions). 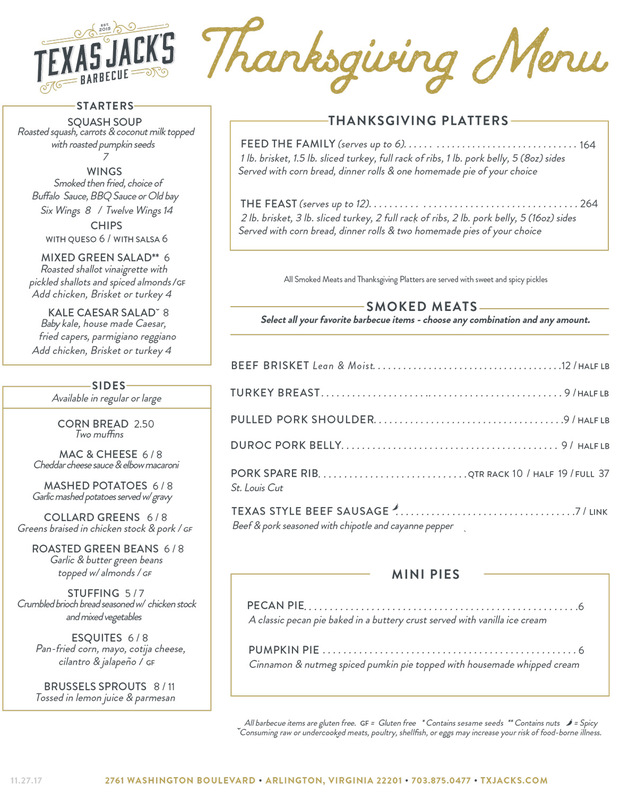 Click here to see our full Thanksgiving menu. Perhaps you’d like to enjoy a delicious meal without going to the trouble of sweating the day away in the kitchen. After all, Thanksgiving is a day to be thankful and enjoy the company of the people you’re with. You don’t want to be spending that time without actually getting to talk to your guests, do you? 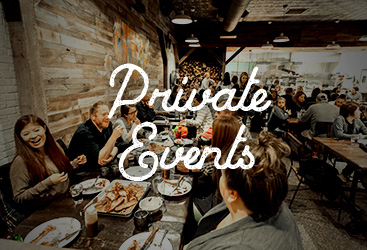 We make it easy with two different Thanksgiving catering packages. Whether you need to feed five people or ten people, we give you the meats you’ve been craving along with your choice of sides as well as a choice of pumpkin or pecan pie. 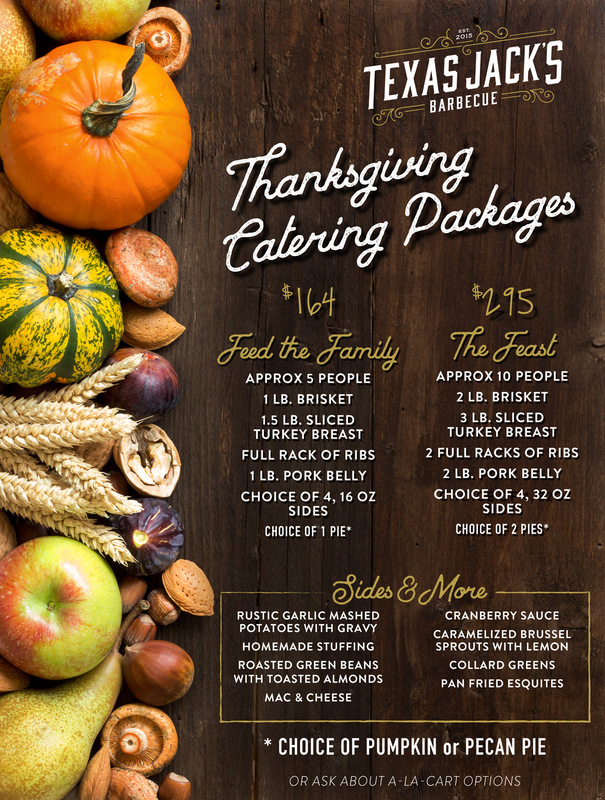 Click here to see our Thanksgiving catering packages. Our BBQ restaurant sure has a lot to be thankful for this year, and we’re proud to be able to play a small part in making your Thanksgiving meals a success. 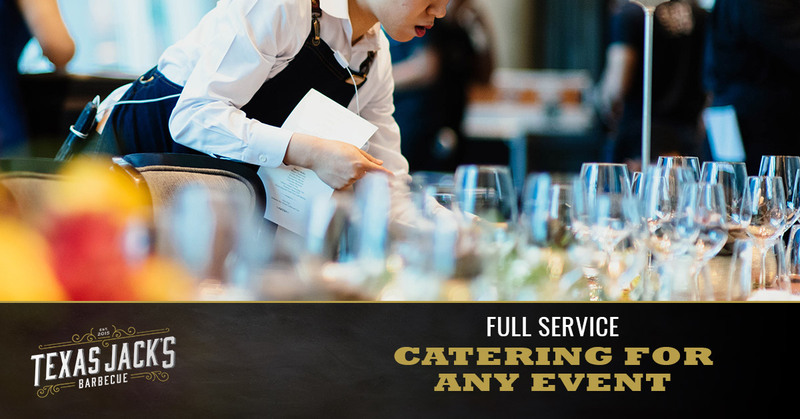 No matter what your plans are, you’ll be happy to hear that we’re a restaurant that caters to your needs (if you’ll please pardon that terrible play on words). Perhaps you already have plans for Thanksgiving. Not to worry! 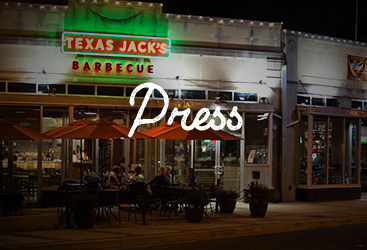 Your favorite barbecue joint is easy to enjoy right now whether you prefer to dine in, take out, or order online. Place your order and enjoy!